According to the respected NY USA Charity, AHRP [the Alliance for Human Research Protection] President Obama’s administration is proposing to change US law to test anthrax vaccines and other bioterrorism counter-measures on underprivileged US children. Obama’s proposals appear to violate fundamental medical ethical principles mandated under the Nuremberg Code after the atrocities committed by the Nazis during World War II, 1939-45. These US children are also more likely than not to be black US children due to the inequalities in the US social, economic and political systems. There is action you can take about this – see below for where to send emails and to download and read yourself the official US government documents announcing consultations on these issues. But now it is being suggested he is ready to sell underprivileged US children down the river to be used as test fodder for experimental vaccines. The USA has a history of using underprivileged people and particularly black people for medical experiments. It is not a country with a good human rights record. This does not do much for Obama’s US human and civil rights record. The Obama Administration is seeking approval to conduct morally impermissible, wholly non-therapeutic medical experiments that would expose healthy children to risks of serious harm. Specifically, the Department of Health and Human Services is seeking to test the highly controversial, dangerous Anthrax vaccine, on children. For over a year, the Commission has been attempting to find a rationale for endorsing a proposed government policy that would violate fundamental medical ethics principles. Principles mandated under the Nuremberg Code after the atrocities committed under the Nazi regime came to light. Under US Law, research involving greater than minimal risk and no prospect of direct benefit to individual [child] subjects, is prohibited in healthy children. (45 CFR 46, subpart D). If not stopped, the US government would override ethical and legal prohibitions by testing “medical countermeasures” on unprotected children who are legally incapable of giving informed consent. The government would subject healthy but socioeconomically deprived American children to unjustifiable risks of harm–to be exploited as human guinea pigs. The overarching question — not specified by the Commission or the Administration — is, WHOSE CHILDREN ARE TO BE SELECTED for experiments that violate ethical and moral standards? If history is a guide, underprivileged children’s best interest will sacrificed to serve as a means to an end that will benefit powerful commercial and government entities. More than a decade has passed since the US was attacked by terrorists, Sept. 11, 2001. No biochemical weapon has ever been shown to pose a threat to Americans — neither military personnel nor civilians. The only exception was the mailing of anthrax laced envelopes in October, 2001, by a US military scientist, from a US military laboratory – who is now dead. There is no evidence whatsoever of an anthrax threat to American children. WHOSE CHILDREN WILL BE EXPOSED TO THE SERIOUS RISKS OF THE ANTHRAX VACCINE–WITHOUT ANY POTENTIAL BENEFIT FOR THEM? WHOSE CHILDREN WILL BE USED AS HUMAN GUINEA PIGS? Below are the warnings on the Anthrax Vaccine label. Approximately 6% of the reported events were listed as serious. Serious adverse events include those that result in death, hospitalization, permanent disability or are life-threatening. cellulitis, cysts, pemphigus vulgaris, endocarditis, sepsis, angioedema and other hypersensitivity reactions, asthma, aplastic anemia, neutropenia, idiopathic thrombocytopenia purpura, lymphoma, leukemia, collagen vascular disease, systemic lupus erythematosus, multiple sclerosis, polyarteritis nodosa, inflammatory arthritis, transverse myelitis, Guillain-BarrÃ© Syndrome, immune deficiency, seizure, mental status changes, psychiatric disorders, tremors, cerebrovascular accident (CVA), facial palsy, hearing and visual disorders, aseptic meningitis, encephalitis, myocarditis, cardiomyopathy, atrial fibrillation, syncope, glomerulonephritis, renal failure, spontaneous abortion and liver abscess. Infrequent reports were also received of multisystem disorders defined as chronic symptoms involving at least two of the following three categories: fatigue, mood-cognition, musculoskeletal system. 3. The vaccine hurts more than other vaccines. What are the possible or reasonably likely side effects of BioThrax? With the kind permission of Vermont State Senate candidate Robert Wagner, Vermont, USA, we reproduce here below an article from Robert Wagner‘s site. He is an American doing politics. He is pro-child health safety from conviction. He is pro-vaccine choice. He is a Liberty Candidate. Last time he stood for the Vermont State Senate, he did not win. He may not win next time. But what he did and will do is take votes. Robert Wagner seems a quiet American. But the Robert Wagners of the USA are giving you a choice when it comes to voting. You can choose not to vote for the politicians who keep failing you and your children. The Robert Wagners give you much more besides that – a choice to vote for someone who does stand up for your children in politics and a chance to place your vote elsewhere. If enough of you do it, the Robert Wagners will win. Robert Wagner is campaigning to get 30 new independent Liberty candidates into the Vermont State Senate including himself. So if he succeeds Vermont will not have just one Robert Wagner. It will have 30 to take the votes from the Republicans and Democrats. And some of the 30 could just win too. With your help all of them could. The one thing other candidates cannot afford is for someone to be taking their votes from them. The autism community has real political power. With 1 in 100 US children having an autistic condition but with parents and many more family members, aunts, uncles, grandparents each child can potentially call on many more votes than 1% of the voting population. In States like New Jersey one in 49 children — one in 29 a boy — has an autistic condition – autism is now a world-wide pandemic: Autism rates hit ‘epidemic increase’ in N.J. Thursday, March 29, 2012 BY LINDY WASHBURN STAFF WRITER The Record. The well-known to be corrupt United Nations organisation, W.H.O. only declares pandemics for its drug industry paymasters for money-making scams like swine and bird flu: Children Risk Untested Flu Vaccines In Hyped Pandemic July 29, 2009 by sarah106. Sometimes elections are won on just a few votes and a 1% swing can make a huge difference to some elections and then to the balance of power when Senate membership is finely politically balanced between Republicans, Democrats and others. You can read about Robert Wagner’s political positions by clicking here. Autism and vaccination freedom for parents, children and families is not or should not be a party political matter. But you cannot afford to wait for election time. In the run-up to the US Presidential elections in 2008, candidates Obama, McCain and Clinton all jumped on the autism bandwagon and then did nothing later about taking action to stop the causes of children developing autism. So even when the candidates are forced to appeal to particular voting interests, once elected they do nothing. Politicians need to know well before they are standing for reelection that next time you won’t be voting for them when they fail to deliver and that you will vote for the candidate who is standing up for and will do something for your autistic child. So in Vermont, don’t wait until election time again – tell the other politicians right away, while they are wasting your child’s life doing nothing, that you want action now or you will vote for one of the Robert Wagners of the USA. You may not live in Vermont but the same principles could work where you live. Americans need conviction politicians like Robert Wagner, doing his bit because he believes he should for the greater good. Whether he wins or not next time around, parents and families of autistic children can do something before it comes to the ballot box. When you have candidates like Robert Wagner you can tell the incumbent politicians you will be voting for your local Robert Wagner and taking your vote away from them. Some are calling this “‘compromise’, because most things in Montpelier are about ‘compromise’.” I disagree. Compromise between whose interests? Why should our elected representatives compromise our interests for the sake of corporations, for the 1% who already make a killing here in Vermont? But—I imagine—the corporate money is too good to pass up. Not to mention federal block grants, handouts to localities in return for giving even greater subsidies to corporations (out of our paycheck tax withholding). This is a machine politician’s measure of success… selling out his people in return for those grants. The Vermont Legislature keeps trying to close down schools (more on Act 155 in a later article), but handouts to corporations since 1998 total $231,328,428. These are tax subsidies, loopholes and outright payments from our tax withholding. You can find this information yourself on the Subsidy Tracker at Good Jobs First. Monsanto defeated the second Vermont GMO labeling bill this year, by combined threats and lobbying. According to the Union of Concerned Scientists, Monsanto spent $8 million on lobbying efforts in 2010 alone, and gave more than $400,000 in political contributions. Monsanto also spent $120 million on advertising, to convince consumers that genetically engineered foods are safe—despite overwhelming scientific evidence showing otherwise. My opponent, Claire Ayer, backed S.199, a bill introduced by Sen. Mullin (20 grand from out-of-state in the 2010 election), which attacked the very concept of informed consent. On behalf of Big Pharma. I am running against Claire Ayer to protect your rights and liberties, which are not for sale. I’ve set the stage, connecting forced vaccinations and GMOs. Now you know why the machine incumbents need to go. Start with the Senate, there’s just thirty seats, it can be done. It won’t be easy, they have wads of out-of-State money and influence behind them. Let’s show them that real Vermonters can’t be bought through out-of-State influence peddling. The biotech industry has had to use corruption and threats to keep secret what they continue to claim is safe and “substantially equivalent” to normal food. (MONTPELIER, VT) - Vermont was slammed by the biotech industry twice this month. They were hit the first time when 90% of the population wanted GMOs in their food labeled but the governor would not sign a bill requiring this because the biotech giant Monsanto threatened to sue the state. Monsanto thus stopped “informed consent” around food, leaving people without crucial information needed to decide what goes into their and their children’s bodies, and are thus essentially tricked into eating it in not know what is what. Instead of informed consent required in medical experiments – and this is one of the largest in human history – there is enforced ignorance. The biotech industry has had to use corruption and threats to keep secret what they continue to claim is safe and “substantially equivalent” to normal food. To truly preserve the philosophical exemption in Vermont, the parents would have had to get the legislature to pass NO law modifying this exemption — and they did NOT do this. Nicole Matten lost her 7 yr old daughter Kaylynne last December, 92 hrs after she received a flu shot. Click picture for details. The vaccine against whooping cough seems to be putting children at INCREASED RISK of whooping cough. California is experiencing its worst whooping cough outbreak in more than 60 years. Thousands of people have gotten sick and 10 infants have died, including two in San Diego County. Health officials across the country are trumpeting pertussis vaccinations, but a four-month investigation by KPBS and the Watchdog Institute, a nonprofit investigative center based at San Diego State University, has found that many people who have come down with whooping cough have been immunized. [Dr. Friz] Mooi, who heads the Pertussis Surveillance Project at the National Institute of Health in the Netherlands, said an epidemic in 1996 in his country gave the need for research more urgency. “And we found really a kind of new mutation in that bug,” Mooi said. In tests, Mooi’s lab found the mutated strain produced more toxins, which could make people sicker. The health care providers in Vermont are not informing Vermont parents of this danger. Nor are they informing all the parents in Vermont that they have a human right to refuse any or all vaccines. Thus, at both the medical level and the human rights level, there is no “informed consent” in Vermont whatsoever. But the situation is worse than that. By requiring parents who do not wish their child vaccinated to sign a document saying that they know that by not vaccinating their child they are endangering others, the state of Vermont is withholding parents’ human right to refuse vaccines unless the parents lie on a legal document. The Senate Health & Welfare committee voted 3-1-1 to remove the philosophical exemption to mandated vaccines, without ever holding the promised public hearing. Senator Ayer: yes; Mullin: yes; Miller: yes; Pollina: no; Senator Fox: absent. Ayer, Mullin & Miller MUST GO. Vote them out!!! In Vermont, in the place of “informed consent,” the state now offers “coerced misinformation” as the requirement for parents to refuse vaccines. This is a stunningly invidious and deceptive undoing of “informed consent” around vaccines (which now all use GMOs), just as is any refusal to label GMOs in food. As the FDA with a Monsanto lawyer working there at the time, hid 40,000 documents showing extreme toxicity of GMOs (exactly as Monsanto hid the deadly toxicity of its PCBs for years), the biotech behemoth Monsanto relied on massive PR to promote lies about GMOs better yields and safety, has planted them without approval here and in other countries, routinely threatens farmers with law suits, and now has threatened to sue the state of Vermont to keep its “safe” GMOs unlabeled, etc. Parents are being their human right to know what is going into their children’s bodies, information they need to consent or to refuse. But in the case of vaccines, the biotech industry not only uses corporate giants like Murdock’s news empire to lie about vaccines and excoriate doctors who are researching them, but is using legislation like that in Vermont to force parents to tell lies for them, about the dangers of not taking vaccines. The reality of the growing dangers of taking biotech’s vaccines is missing. No investigation of Murdoch’s crimes should omit his efforts to use his media empire to prevent exposure of potential dangers from the MMR vaccines and possibly all the new DNA vaccines. The destruction of “informed consent” in Vermont around what goes into its children’s bodies is complete and then some. NOT requiring that GMOs in food be labeled, thus is choosing NOT to inform its people of the presence of highly toxic material. NOT informing about GMOs presence in food though 90% of its people want to know; and in NOT requiring that information Vermont has obliterated any true consent or refusal. leaving Vermonters to ingest and feed their children highly toxic GMO material solely out of ignorance. Exposing Vermonters and their children to GMO material that is associated with destroying reproductive organs so is acquiescing or promoting the destruction of fertility among Vermonters. NOT informing about vaccine exemptions and is thus denying Vermonters “refusal,” coercing them through their ignorance of exemptions, to get their children vaccinated. NOT informing about the biotech industry’s new vaccines and their increasing dangers to children’s genetic make-up or about the increasingly disturbing ingredients the government is producing for them. NOT informing parents that each child’s ownership of their DNA is being stolen by the introduction of synthetic patented material which the pharmaceutical could lay claim to as Monsanto is doing now with GMOs in crops. Morcing parents to sign legal documents attesting to false (and frightening) information as a requirement to avoid vaccines – removing parents’ rights to refuse while making parents to agents of misinformation. Making pariahs of parents who are forced to sign legal documents falsely agreeing they are putting other people’s children at risk. There is more than a surface similarity to keeping toxic GMOs in food unlabeled and twisting of vaccines exemptions into almost non-existence. The biotech industry produces both the patented GMOs in food, and the patented GMOs in vaccines. Both are contaminating DNA (one in plants, one in humans) and causing genetic mutations. One set of GMOs is contaminating crops via GMO pollen, and that unstoppable contamination provides a means for the drug corporations to take “ownership” over plant DNA via patents. The other set of GMOs is contaminating human-DNA via vaccines and laws voted for by corrupted legislators, and that legislatively-driven contamination provides a means for the drug corporations to take “ownership” over human-DNA via patents. Coalition for Vaccine Choice demonstrates in Burlington in front of appointed Health Commissioner Harry Chen’s office. Chen showed a misleading map to Legislatures to pretend that there’s a health emergency, on behalf of Big Pharma. If you repeat a lie often enough, people start believing it. Nationally, right now, there is a flood of biotech industry moves to aggressively remove all obstacles to their patented GMOs in food and to their patented GMOs in vaccines. Whether by introducing laws to criminalize all dissent to GMOs in plants and vaccines, paying to make whistleblowing a felony, planting two years before any charade of an approval process, corrupting agencies so they turn regulating the biotech industry over to the biotech industry itself, removing all liability over vaccines, inserting a new rule to all manufacturers to insert whatever they want, creating laws that would force untested (GMO) vaccines on the public in an unproven emergency, censoring news stories on safety even as HHS makes a banned substance, threatening and blocking journalists writing on a GMO drug, hiring Blackwater to infiltrate anti-GMO groups, attacking doctors studying dangers or attempting to destroy scientists’ careers, the facade of “health” for GMOs is slipping and showing a dark side mated to corruption of many kinds. When the public which hates Monsanto for contaminating farmers’ fields and laying claim to what it caused, realizes that vaccines are coming from the very same industry and are contaminating human-DNA, it will look at the things it’s been told about vaccines and ask where that “information” came from, and what have independent scientists been saying. It will look at the 47,500 cases of paralysis caused by Bill Gates in India, and his saying just what Vermont is forcing parents to sign – that those not taking vaccines are endangering others. Gates said vaccine skeptics are killing children, using a brutal McCarthy approach to try to silence parents who are justifiably concerned with vaccine safety. Gates’ polio vaccines killed children and at twice the rate as natural polio. Parents in Vermont, to protect their children from vaccines, must sign that by not vaccinating they are putting others at risk. The Vermont legislature, in depriving the state of informed consent that would include information on the pertussis vaccine that is spreading whooping cough, the polio vaccine that is paralyzing children, the MMR vaccine now associated with mitochondrial failure, the measles vaccines that are failing, all the new DNA vaccines which alter DNA with patented GMOs, all the mandated vaccines and the flu vaccine containing polysorbate 80 (an ingredient destructive of fertility), etc. and inform Vermonters what food there contains GMOs which the FDA knew were highly toxic in the 1990s and hid the evidence and which now are destroying reproductive organs, and causing lethal diseases. Informed consent is the bedrock of medical ethics. What the Vermont legislature is doing to lives and freedom of its own people, it is doing for the sake of the biotech industry. My opponent, Claire Ayer, backed Mullin’s S.199 and voted it out of committee, caving in to Biotech and Big Pharma. According to the latest NPR-Thomson Reuters Health Poll conducted for US National Public Radio 46% of Americans polled were concerned about a fear of side effects of vaccines and 47% of respondents had concerns about uncertainty about long-term health effects. Autism remains a top worry, with 21 percent of respondents saying they believe autism is linked to vaccines. About 7 percent believe in a link between vaccines and diabetes. Among households with children under 18, 30 percent were concerned about the safety or value of vaccines. Why are so many schoolgirls suffering serious health problems after they get Gardasil the HPV [human pappillomavirus vaccine] with some dying? It looks like international safety organisation SaneVax has found one of the reasons. Contamination with an internationally known and recognised biohazard – toxic genetically modified recombinant DNA – it is recognised this can cause mutation and worse. Why do the US Food and Drug Administration and the UK Medicines Healthcare and Products Regulatory Agency authorise these dangerous vaccines and then hide the adverse reactions which then occur? When are their officials going to be sent to jail? When are drug company Board Directors going to be sent to jail? You cannot get the real news in the press or on TV. You cannot trust them to do their job or tell you the facts. But there are independent sources on the web which will tell you. In seeking answers to why adolescent girls are suffering devastating health damage after being injected with HPV vaccines, SANE Vax, Inc decided to have vials of Gardasil tested in a laboratory. There, they found over a dozen Gardasil vaccine vials to be contaminated with rDNA of the Human Papillomavirus (HPV). The vials were purchased in the United States, Australia, New Zealand, Spain, Poland and France, indicating Gardasil contamination is a global phenomenon. That aluminum is also found in vaccines should be frightening all by itself, given that aluminum should never be injected into the human body (it’s toxic when ingested, and it specifically damages the nervous system). With the added discovery that the aluminum adjuvant also carries rDNA fragments of two different strains of Human Papillomavirus, this now reaches the level of a dangerous biohazard — something more like a biological weapon rather than anything resembling medicine. The rDNA that was found to be contaminating Gardasil is not “natural” rDNA from the HPV virus itself. Rather, it is a genetically engineered form of HPV genetic code that is added to the vaccines during their manufacture. The vaccine industry, of course, has a long and dark history of its vaccines being contaminated with cancer-causing viruses and other frightening contaminants. Listen up, folks: Why do you think the vaccine industry pushed so hard for total financial immunity under the government’s vaccine injury compensation plan? Because they knew that if the truth ever got out about how many cases of cancer, autism and even death were truly caused by vaccines, they would be financially wiped out! For those familiar with the British Medical Journal’s allegations of fraud against Dr Andrew Wakefield, here is a summary of the main points for reference and assistance to cut it down to easily manageable proportions. Contrary to the key aspect of the BMJ Editors’ allegations that Andrew Wakefield changed prior medical histories of the children to fabricate a new finding of developmental disorders related to bowel conditions in children, Wakefield did not originate the data reported in the 1998 Lancet paper. To allege fraud requires a comparison between the information originated by the clinicians and what the Lancet paper says. The BMJ and their commissioned author Mr Deer did not do that. They also changed what the paper was reporting to fit what they wanted it to say to allege fraud. They cherry-picked information from family doctor records and the GMC hearings to allege there were discrepancies. 12 children … with a history of normal development followed by loss of acquired skills, including language, together with diarrhoea and abdominal pain”. 3) whose symptoms of autism were first indicated within 14 days of the MMR vaccine. But the Lancet paper was not reporting that. So what Deer and the BMJ did was to 1) select data 2) which would not match what they claimed the Lancet paper reported. 3) most regressed but the first indications of a behavioural change were not documented for all so the paper could clearly not report first signs of behavioural changes occurring within 14 days. The BMJ Editors and their author Brian Deer also did not have important information, such as the final assessments of the bowel conditions of the 12 children investigated within the Royal Free by the clinicians – not Wakefield – showing most diagnosed with non specific colitis [11/12]. 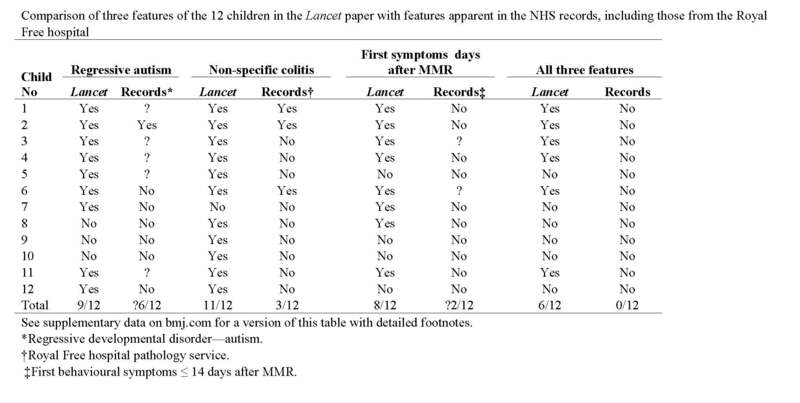 So the numbers of children with diagnoses which BMJ/Deer reported were wrong. Nor did they have the “Personal Child Health Records” documenting whether a child is developing within the “normal range” of development or not. These aspects of information not available in the GMC proceedings were dealt with and mentioned in the GMC transcripts but Deer and BMJ seem to have “overlooked” them. The 1998 Lancet paper was drafted by Dr Wakefield but it reported the findings of the 12 expert specialist Royal Free Hospital clinicians. The various versions were circulated to the other 12 authors for comment, amendment and approval. Wakefield was a researcher and not an investigating clinician. In particular, the medical histories of the 12 children reported in the paper were taken by Professor John Walker-Smith of The Royal Free Hospital, London, England. The diagnoses of bowel conditions of the 12 children were made by Dr Dhillon, with consideration and comment by his colleagues. The diagnoses of autistic and other conditions in 8 children were made by Dr Berlowitz and in 4 cases by independent external medical experts not connected with The Royal Free Hospital. The BMJ engaged in blatant cherry-picking. One month before her MMR vaccine Child 8 was recorded by an independent specialist developmental pediatrician [unconnected with The Royal Free Hospital] as within the normal range of development aged 18 months. One month after the MMR vaccine, aged 20 months, the same pediatrician records she was functioning at the age of 12 months. She regressed 8 months in the space of 1 month following the MMR vaccine. Child 1’s mother reported he was having trouble hearing before MMR. The BMJ and their author Brian Deer claim this was a sign of autism. The family doctor however recorded Child 1 had a discharge from his ear, indicating an ear infection. How did the BMJ and their peer reviewers failed to notice that? Or was it they did not care as long as they could accuse Andrew Wakefield of fraud? Bizarrely, to cover up the failure over the Personal Child Health Records the BMJ’s author Deer claimed only a negligent doctor would refer to them and scathingly referred to them as “baby books”. The fact is he had never seen them. More importantly, it is clear they these “experts”, he and the BMJ, did not know these are “prospective developmental records” and were cited specifically in the 1998 Lancet paper as a source of information for clinical and developmental histories reported. But still thought themselves “expert” enough to allege fraud against Andrew Wakefield. The PCHR is an 81 page book issued by the NHS to every UK parent of a newborn child to capture information up to the age of 5 years recorded by health visitors, midwives, nurses, doctors and parents to ensure the health and normal development of children in the UK. It is the obvious place of first reference when checking a developmental history. Neither Deer nor the BMJ even noticed the omission. BMJ & Its Editors’ Failures to Declare Conflicting Drug Industry & Vaccine Manufacturer Financial Interests. The BMJ Editors’ subsequent Conflict of Interest correction was no ordinary matter – they failed to disclose material conflicting interests, it involved three senior editors of the BMJ and it relates to amongst other matters, ongoing business and financial partnerships between the BMJ and the pharmaceutical industry. The correction was forced finally by explicit criticism posted in the BMJ electronic responses from the US New York based charity the Alliance for Human Research Protection [AHRP]. This was in addition to public outcry in a deluge of emails from parents of children with autistic conditions in the USA and elsewhere. It should have gone further. A clear statement should have been made in the next available journal to follow and it should be presented in every printed edition and on the home page of the online edition for every edition. They tried to minimise their very serious error by some circumspect reasoning described by AHRP as “startling”. The BMJ editors claimed “We didn’t declare these competing interests because it didn’t occur to us to do so“. Mildly put that shows that editorial diligence and forethought was lacking. That in itself should have been enough to retract the journal articles … that was their contention with Andrew Wakefield. Couple that with witness and institutional conflicts of interest not revealed or elaborated to the general public and the possible ethical breaches of patient confidentiality then one wonders how this still remains in the public arena. You cannot trust your doctor and you cannot believe him or her. When you visit your doctor he or she is part of this. He or she is sitting back and letting this go on under his or her nose without complaining – keeping silent – saying nothing. He or she is the person prescribing for you and your children and families drug industry products which kill and injure because they have not been tested properly like Vioxx and vaccines and/or because they are useless, but he or she is happy to enjoy the money earned doing that. He or she is the person who gets your private medical information but you cannot trust them with it because he or she sits back and does nothing when children’s medical records are illegally disclosed and used by a journalist who then writes about them in the British Medical Journal. He or she is a member of The British Medical Association, the doctors’ trades union, or one like it outside the UK. The BMA is a symbol of our morally and politically sick society. The BMA sits back and takes the substantial profits of wrongdoing from its own journal, the British Medical Journal. The BMA’s official line is that it does not control the running of the BMJ and its stable of other journals and pretends to the public and patients it can do nothing about it. The BMA is a politically powerful organisation with the British government but pretends it cannot control its own house journal mailed every week to all of its members. But if the BMA cannot control its own house journal, guess who can exercise control over the BMA? Yep, BMJ Editor-in-Chief Dr Fiona Godlee is a Chief Officer of the BMA: [BMA Chief Officers]. Her name appears first on the BMJ Editorial falsely accusing Dr Andrew Wakefield of fraud. Over and above all that, the BMA is a trades union. It does not represent you or your children or your wider family when it comes to health. It is there to get and keep money in the pockets of its members, and it looks like when it comes to the BMJ and the drug industry, it really does not care how it does that. And when the BMA makes public statements on health matters and lobbies the British government for what it wants, you can be sure that is not done with you the patient, your children and family in mind, even if that is claimed to be the case. The current Chairman of the BMA is Professor David Haslam and the Chairman of The BMA Council is Dr Hamish Meldrum: BMA Chief Officers. … he is keen to ensure that both the organisation and the profession are well prepared to meet the challenges of ensuring that doctors are supported and fairly rewarded in delivering the highest possible quality care to their patients and that the NHS remains true to its founding values and principles in an increasingly complex environment. His interests, outside medicine and medical politics, when he has time, include sport (watching lots and participating in keep fit, tennis, swimming and dormant golf), hill-walking, photography, music (quite varied tastes), cooking (also varied tastes) and wine. It does not say anything about maintaining the reputation of the British medical profession for high standards of ethics and probity. Enjoy your “dormant golf” Dr Meldrum. With all those outside sporting interests Dr Meldrum’s time is clearly taken up with a lot of balls. With so many in the air, has he dropped the BMJ’s? May 4, 2011 — A new study, published in Human and Experimental Toxicology, a prestigious journal indexed by the National Library of Medicine, found that developed nations with higher (worse) infant mortality rates tend to give their infants more vaccine doses. For example, the United States requires infants to receive 26 vaccines (the most in the world) yet more than 6 U.S. infants die per every 1000 live births. In contrast, Sweden and Japan administer 12 vaccines to infants, the least amount, and report less than 3 deaths per 1000 live births. The United States spends more per capita on healthcare than any other country yet 33 nations have better infant mortality rates. Some infant deaths attributed to sudden infant death syndrome (SIDS) may be vaccine-related, perhaps due to over-vaccination. Progress on reducing infant deaths should include monitoring immunization schedules and official causes of death (to determine if vaccine-related infant deaths are being reclassified).Infant mortality rates will remain high in developing nations that cannot provide clean water, proper nutrition, improved sanitation, and better access to health care. Funding Acknowledgment: This research received no specific grant from any funding agency in the public, commercial, or not-for-profit sectors. Open Access: The National Vaccine Information Center (NVIC) donated $2500 and Michael Belkin donated $500 (in memory of his daughter, Lyla) for open access to the journal article making it freely available to all researchers.